As seventh-grade Woodrow Wilson student Baelee Stearley stood in her cheerleading uniform, with the gold beads of a Saudi Arabian headpiece resting on her forehead and covering her red-ribboned ponytail, she embodied the message of the day. While those words may not have been overtly spoken, the message couldn't have been clearer for the 373 West Vigo and Woodrow Wilson middle schools students who visited the Booker T. Washington Community Center. Within the walls of the center, Indiana State University international students did their best to bring their countries to life. "You are going to travel around the globe today and share the traditions and lifestyles of many people," said Terre Haute Human Relations Commission Director Jeff Lorick, who served as host of the event. Lorick directed students about how to proceed through the tables of displays represented by 10 countries. "You'll probably visit places you've never seen before," he said. Increasing awareness of and appreciation for a variety of cultures was the purpose of the Day of Global Understanding. The event, organized and co-sponsored by Indiana State University's offices of Diversity and International Programs and Services, was also co-sponsored by the Terre Haute Human Relations Commission and Vigo County Public Schools. Woodrow Wilson Middle School Principal Sharon Pitts said the day is an effective way to introduce students to places they might not otherwise have a chance to visit. "Many of our students never leave the United States," Pitts said. "Hearing about these places from a teacher in a classroom or reading about them in a book isn't the same as hearing about them from these ISU students who have lived there. "Where else will our students get an experience like this," she said. Emmah Kamau, a 25-year-old criminology graduate student from Kenya, Africa, spent her time with students describing indigenous clothing like the Khanga, a large colorful scarf that often bears a hopeful message and is the staple of an African woman's wardrobe. But she placed the most emphasis on her parting words. "If you respect people around you it is your gateway to success," she said. "If you forget everything else we learn today, don't forget respect. That's what's special in my culture." Zachariah Mathew, a graduate student and International Programs and Services intern who was raised in India before he moved to the United States 10 years ago, helped spearhead and organize the event. His goal was not just to educate middle students, but to create a setting in which ISU international students could interact with the community. "This is a bridge that can go both ways," he said. "It's not only that the [middle school] students are getting exposure or experience. But the international students of ISU are also getting to know the community." Woodrow Wilson Middle School student John Sponsler said he appreciated having the opportunity to learn about different countries and it inspired him to want to travel to Europe. While Sponsler particularly enjoyed seeing how his name was written in Arabic, he said he was certain he wouldn't be able to duplicate it. But for Mathew, it's the introduction to acceptance that was most important. "In schools we should sow the seeds of internationalism," Mathew said. "Then we will be able to reap it down the line." 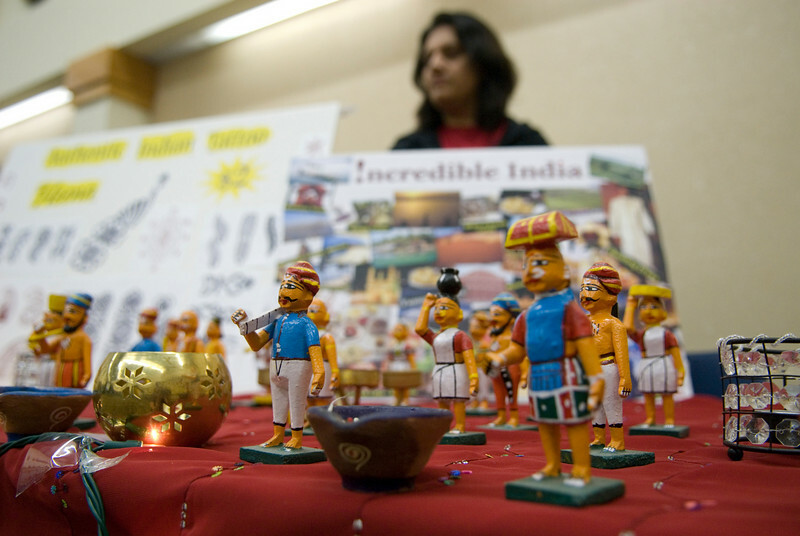 Cutline: A table at the 2008 International Education Week showcases traditional toys and figurines of India (ISU Photo/Kara Berchem). Indiana State University's international students were featured at the Day of Global Understanding in Terre Haute. They shared information about their countries with middle school students, but more importantly, they laid a foundation for acceptance.